I hope that all made sense to you, cause it confuses me. More importantly than the history of the market, is the fact that it’s an amazing food heaven. Perhaps the most well known food in the market, bindaetteok is a mung bean pancake. Mung beans! WTF, bud! That’s gross! Hold up. Mung beans are not only delicious, but they’re also nutritious. Yes, those two words rhyme, but that’s not the reason I used them. Mung beans are a great source for manganese, potassium, magnesium, folate, copper, zinc and various B vitamins. Those copy-and-pasted words don’t rhyme and I honestly don’t know what most of them mean, but know that mung beans are healthy. If you’re still not convinced, mung beans are actually just un-sprouted bean sprouts. You like those, right? If not, go away. The inside of bindaetteok is similar to mashed potato. The outside is crispy and slightly oily. This jeon (the Korean word for minced up food that’s turned into a pancake and fried) goes great with makgeolli. You can find bottles of this fruity rice alcohol all over the market. It’s sweet and milky. The Koreans say, because it’s unfiltered, that it’s the healthiest alcohol with decent levels of protein, fiber, and probiotics. The alcohol percentage ranges from 6-8%. The best part: you drink it out of a bowl. These little sushi rolls are cheap and delicious. Gimbap is the Korean version of sushi (literally “seaweed rice”). 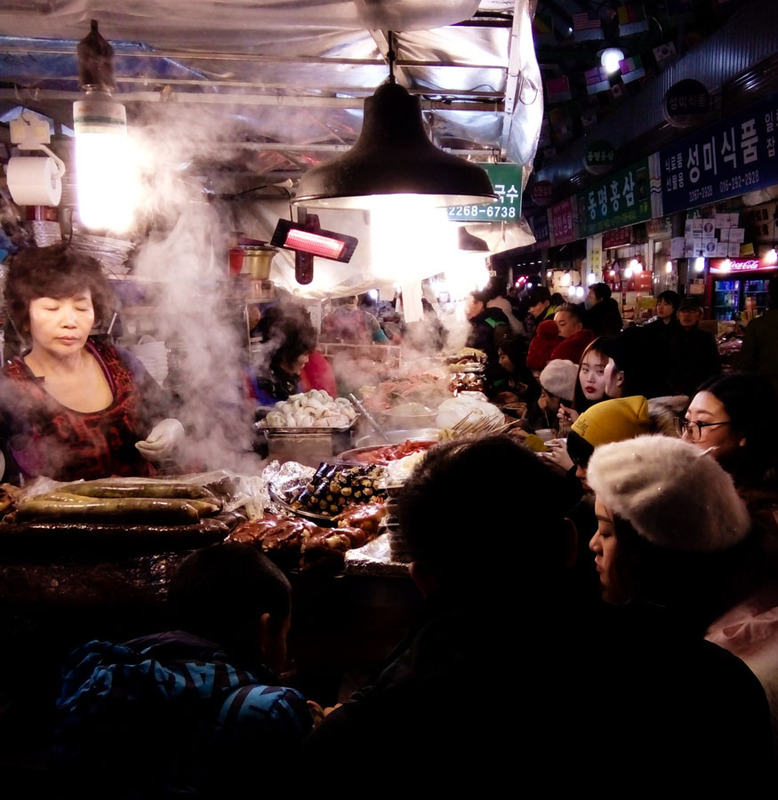 Gwangjang Market’s version is called Mayak because it’s addictive (‘mayak’ means ‘drugs’). Korean sushi uses sesame oil instead of rice vinegar. I think the only difference between regular gimpab rolls and the mayak version is the dip. They’re served with a wasabi-mustard combo, which adds a punchy spice. This is Korea’s version of steak tartar. Raw beef is seasoned with soy sauce, sugar, salt, and sesame oil. Sprinkled on top is often spring onion, minced garlic, sesame seeds, and black pepper. It’s usually served with julienned bae (Korean pear) and a raw egg yolk. If you’ve never had raw beef, this is the time to try it. The market’s yukhoe section has some of the best quality beef in the city. You can watch for signs that say “New beef coming day” (소 들어오는 날). This indicates that the beef is fresh today. This is a soft rice cake that’s cooked in a sweet and spicy red chili sauce. It often contains some meat, maybe fishcake or just hotdog slices. 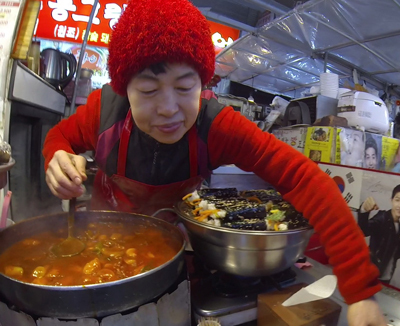 Personally, I found tteokbokki a bit ghetto, but the Koreans (and Sara) love it. It reminds me of Chef Boyardee Beefaroni, but with rice instead of pasta, and a spiciness to the sauce. No. It’s actually the Korean version of blood sausage – boiled or steamed pig intestine stuffed with blood and cellophane noodles. I like ice cream sundaes more, but you should try the sausage. It’s more Korean, and it’s rich in iron. On the second floor, you’ll find the best silk, satin, and linen – much of it used for bed-sheets. Many local people come to the market for the high quality and reasonably priced bed sheets. You can’t eat bed sheets. Subway Line 2 or 5 to Euljiro 4-ga Station and take exit 4. Walk north, across the bridge, you’ll eventually see the market on your right.